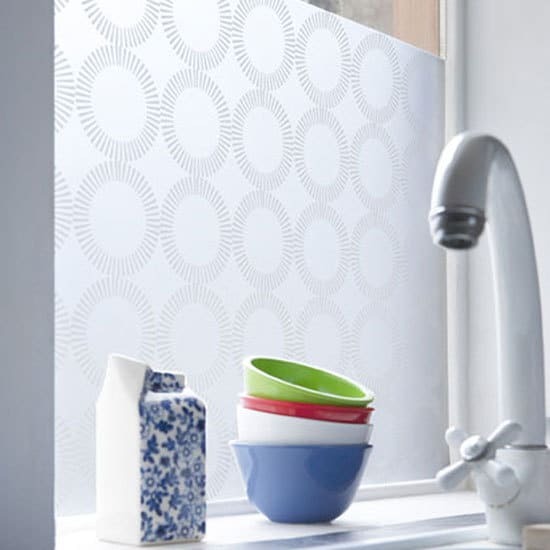 Decorative window film offers an affordable way to add beauty and gain privacy and protection for residential windows. Whether you desire the privacy of frosted glass, the elegance of etched glass, or dreams of a dazzling light display created by stained glass, decorative window film makes it happen. Window films offers a variety of ways to enhance the look of interior windows while simultaneously providing beauty, privacy and UV protection. Unlike etched, frosted, or stained glass windows, window film is easy to maintain. It can be cleaned with regular glass cleaner and a soft cloth without the worry of staining, or the accumulation of dirt and debris on uneven surfaces. It is also easy to remove and replace should you desire a new color or pattern as you change your interior design throughout the years – no costly window replacement required! Whether homeowners prefer a plain white frost or patterns, such as bamboo, geometric shapes, or mock window panes, window film offers a variety of colors and patterns to choose from. Customers often think of window film as a means to provide window tinting and/or privacy. However, window films also come in a variety of patterns, colors, and prints which can transform a window into the focal point of a room. A simple window in a hallway or foyer can be turned into a stunning replica of stained glass art. Bedroom windows can give the appearance of artistically rendered etched glass or a autumn leaf pattern. In addition to privacy and aesthetics, window film can be used to protect your home from UV damage, high energy bills, and it can even provide extra protection from home intruders. Window film offers as much as 99% protection from the sun’s harmful UV rays which can add years to the lifespan of carpeting, window coverings, and home furnishings. It will also save money in terms of energy costs as passive solar heat gain can heat home interiors throughout the summer months. This adds unnecessary dollars to monthly utility bills. Ask about how window film can help to insulate windows and regulate interior temperatures. Specialized decorative window film also offers your home protection from intruders. They hold broken glass pieces together, preventing intruders from gaining access inside. This unexpected hindrance will often prevent smash-and-grab robbers from proceeding. Window film can also protect your home from storm damage. If a window in your home is broken, decorative security window film will hold the shattered glass together until it can be safely and efficiently removed and replaced. If you are ready for a simple, affordable, and attractive way to transform your home’s windows, Contact Daystar Window Tinting Inc.. We are a family owned and operated business and have provided superior experience and customer service to Bay Area residents and businesses for more than 35 years. We pride ourselves on quality workmanship and won’t leave a job site until our customer is 100% satisfied.